Yes, yes. This should have come out a long time ago. Now, let’s get on with it! The Ghost in the Shell live-action film has had some… troubles, to say the least. Box office troubles, to be specific, since 41 million dollars of revenue as of this writing is a flop. The white-washing didn’t help, as well as the sad, sad, fact that Paramount doesn’t seem to get why this is important, which can be frustrating for advocates and activists. From the outset, I’m not going to delve into any white-washing issues in any depth since a great deal of commentary has been made elsewhere, far more eloquently and by people more knowledgeable of the topic than I can ever hope to be. 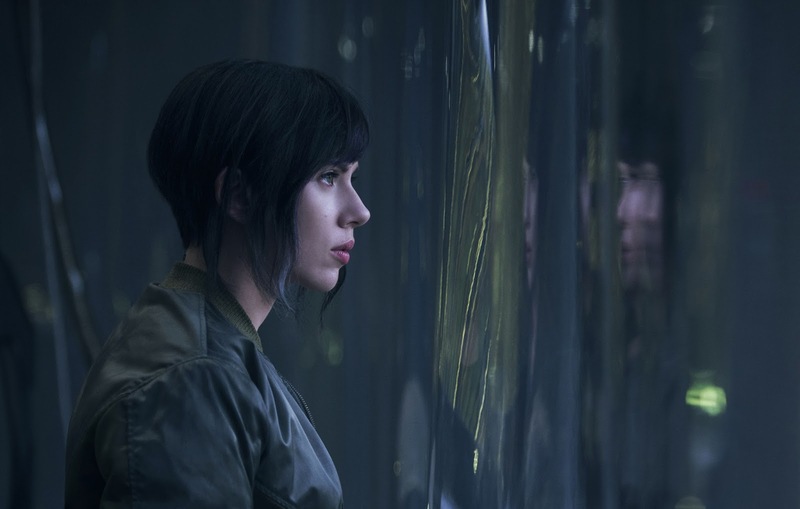 In fact, I linked you to very good resources about some of the discourse surrounding white-washing at the beginning of my write-up about the Ghost in the Shell live-action film preview. When that becomes apparent, Dr. Ouelet becomes a target, so she has to be rescued by her cyborg-baby, The Major. After this, she figures out a way to contact the killer, who calls himself ‘Kuze’. It turns out Kuze is the cyborg prototype that came before her in the project that made her, and that Hanka has taken their memories. Kuze’s motivations is to gain back what he has lost, his memories. This causes a rift between the Major and Dr. Ouelet, and Cutter orders Dr. Ouelet to kill the Major. Rather than killing off the Major or wipe out her current set of memories, Dr. Ouelet chooses to give the Major back the memories from her previous life and to save her life, which makes Cutter kill Dr. Ouelet. The Major becomes a fugitive; she faces off with a giant robot controlled by Cutter, and wins epically. Then she finds her biological mum and newfound satisfaction in her job. The end. Huh, will you look at that? I managed to avoid spoiling the film too much. The film, quite subtly for your standard sci-fi Hollywood fare, deals with themes of personhood, consent and transhumanism. Unlike most cyberpunk films, it avoids pontificating that cybernetics will eat your soul; transhumanist body modification is just something people do. I have no idea if the creators intended this as an explicitly feminist theme, but the theme of consent is very thematically important. One character, Dr. Ouelet, committed such a grievous violation by tampering with the minds and bodies of societal rejects, that she had to die to redeem herself. Even if the film is a bit in-your-face about it, it can be fairly satisfying; it’s not just mindless entertainment. The action is pretty cool, too. Okay, I totally lied. You also need to know the twist: Section 9’s Major Mira Killian is in reality the brain-in-a-jar version of runaway Motoko Kusanagi, who had her memories wiped out in a shady experiment to turn her into a weapon. Her biological mum is Japanese. Holy white-whashing. I award this film 7/10. The Ghost in the Shell live-action film has lots going for it. It’s a solid action piece that makes the fullest of the tech inherent to the setting, most action scenes are well-edited, creative and entertaining. The world is very well-developed and I, personally, find it believable on several levels. However, it has one Big Issue: Racism. It’s embedded in the world-building in a very icky way. A review is too short a format for me to expand on that, but watch out for my Ghost in the Shell analysis pieces! In absence of the racism, I would have awarded this film a 8/10 score, due to some editing and pacing issues, musical score, etc. And, even in the presence of racism, I cannot award it a 5/10, because this is not a mediocre film, and I cannot say it’s 6/10 because, clearly in themes and other aspects, a lot of thought went into making this film. But racism is such a big disqualifier, that I have to reflect in my score somehow and this is why the Ghost in the Shell film gets 7/10. That said, can I, in good conscience, recommend any readers to watch this film? No, I cannot. If you care about diversity, about being respectful, about being mindful of the impact our actions and choices have on people, then I think you shouldn’t spend the green in your pocket on this film in any way or form, even merchandise. I cannot stop you if you want to see this film anyway, and it’s not a bad experience; but I’d really rather you didn’t.